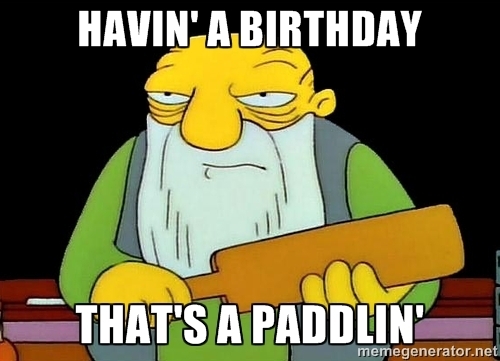 This blog turns three today, which is 21 in dog years. How do we celebrate 21st birthdays? I forget. Besides, I don’t own a dog. I don’t know that there’s much significance to the blog turning three. A lot has changed during the last 36 months, and no, I’m not particularly taking credit for any of it. 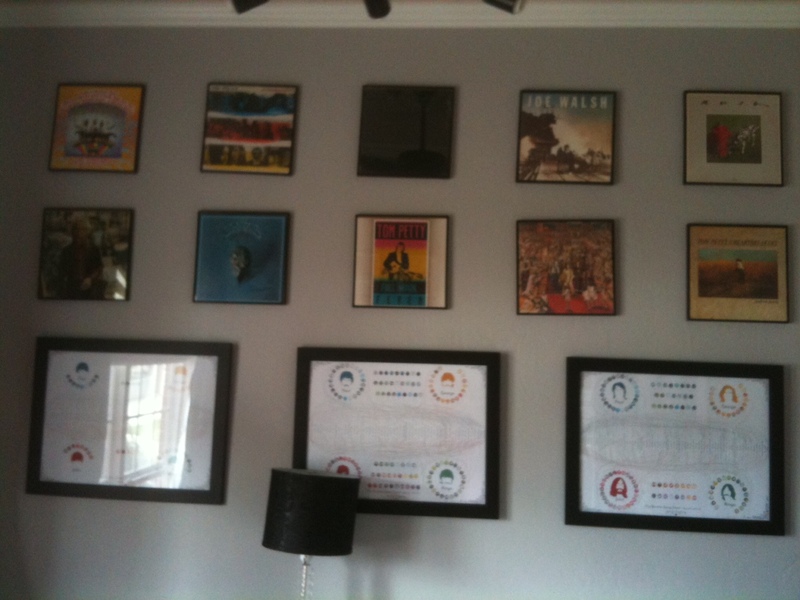 Here are 10 observations from my first 535 posts. 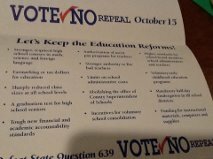 Three years ago, Oklahoma educators were fed up with policy makers who were ripping apart our education system. They’ve had to slow the pace of implementing corporate reform, but they’re still on the move. We’re still fed up. The agenda is still moving forward. Parents are the best voice for public education. As many educators as there are blogging and contacting legislators, we only impact policy to a point. Parents move the needle. Even better is when parents and educators band together to advocate for children. Electing a state superintendent who respects teachers is a game-changer. There’s been a change in the mood among educators since January, but there is only one meaningful difference in terms of the elected leaders of this state. We still have the same governor. We still have the same senators and representatives dredging up the same bills. We still have RSA and ACE; A-F Report Cards; TLE and VAM (though maybe with a delay); and funding for public education is still critically low. The difference is that we have replaced the state superintendent who blames teachers for everything with one who goes to bat for them. 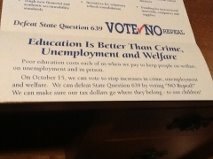 Joy Hofmeister understands that teachers aren’t bad people. Rather they’re the people who spend all day with our children. They deserve respect. High-stakes testing is unpopular with most students, parents, and educators. It’s only certain politicians and “philanthropists” who love it. This seems obvious now, but remember that my first post was filled with frustration that we were sorting and ranking schools by test scores, without regard to poverty. 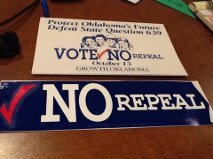 Over time, okeducationtruths has become one voice among many expressing anger over this. Those of us calling for testing reform don’t always agree on solutions, but when it comes to the harmful effects of using tests to label people and schools, we’re together. I enjoy reading blogs probably more than I enjoy writing them. This isn’t a humble-brag statement. If I didn’t think I could write, I wouldn’t. I just know that I’m not the only game in town. 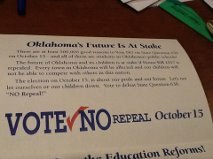 At various times, I’ve tried to capture a list of Oklahoma education blogs and national blogs I read regularly. That list is sadly out-of-date. I’ll probably work on it again when the school year ends. Among my fellow Oklahoma educators are writers who say it better, and bloggers who are more popular. There are also some who are just getting started. I try to read them all. I treasure the friends I’ve made from blogging. These aren’t just shallow acquaintances who happen to share a common interest in saving public education. These are real people with students and families and stories and histories that make them who they really are. Sometimes I just can’t tell what’s going to be a hit. For example, last week I wrote two posts. In the first, I described how I would introduce poetry to my students 15 years ago. I spent hours on it. In the second, I heaped praise on Hofmeister for acting quickly to find a solution to a tough problem. I wrote that in 15 minutes while waiting to pick up my daughter from play rehearsal. The second post has been viewed five times as many as the first one. I’ve received several comments – both privately and publicly –stating that the first was one of my best, which is how I feel as well. That isn’t to say that people are wrong. I am probably just a poor judge of what will stick. 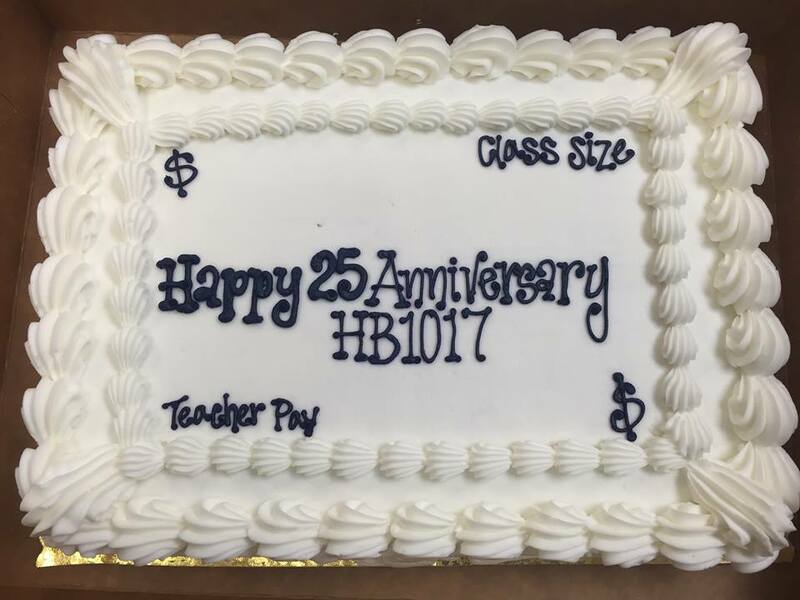 Teacher pay in Oklahoma still hovers around the bottom of the country. My January post discussing teacher pay jumped to number three when it made another viral run around social media in March. In 1970, Oklahoma teachers made 80% of the national average. In 2013, Oklahoma teachers made 80% of the national average. In between, there’s been little fluctuation. At the rally in March, we heard every excuse imaginable from our elected leaders about why teachers can’t have raises right now. This from the same crowd who don’t want to hear excuses from legislators. What they’re really lacking is resolve, and it’s apparently a generational problem that spans decades and knows no partisan preference. Blogging anonymously was fun, but getting to know my readers has been better. At edcamp in February, I was able to participate in a roundtable discussion about advocacy and blogging with the likes of Joy Hofmeister, Jason James, Rob Miller, Kevin Hime, and Claudia Swisher. At this year’s education rally, I had many candid conversations with people about what they’re dealing with at their own schools. I wondered how taking off the mask would impact the blog. It’s more popular than ever. Page views, Twitter followers, and Facebook likes affirm that. I just wish I had more time to write. As Rob explained this morning, we still have much to keep us angered. We don’t fight for self-interest. If that were our motivation, many of us would have changed careers years ago. We fight because we want our schools to be places that help children thrive rather than places that demoralize them. We want teachers to be taken more seriously than tests. Thanks for reading; here’s to another year! 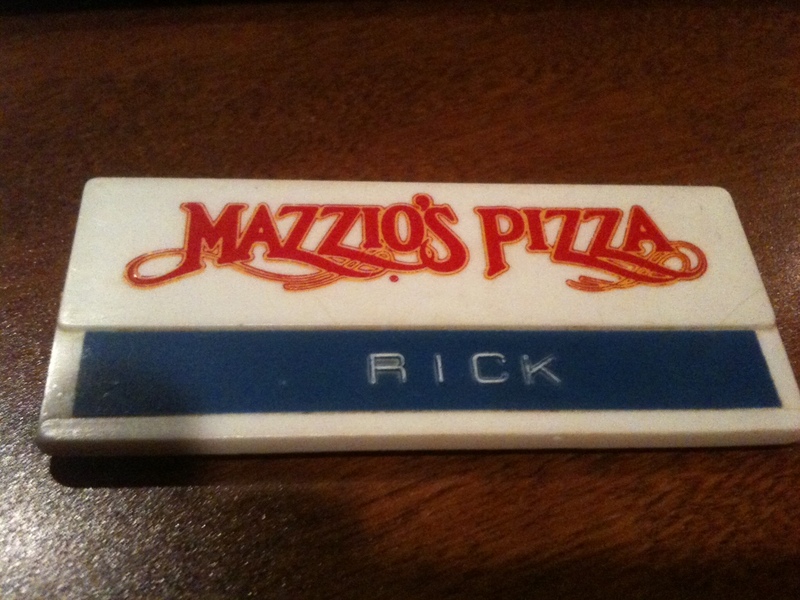 When I was 16, I began my official days as a wage earner at Mazzio’s Pizza on the north side of Norman. At the very minimum wage of $3.35/hour, my goal was to make enough money in one shift to pay for the gas it took my 1974 LTD to drive there and back from the south side of Norman. Sure, gas was something like 79 cents a gallon, but this was one of the great American land yachts. By my admittedly sketchy math, it wasn’t worth my time to work fewer than four hours at a time. I said something along the lines of, “I think so.” She said, “Good, because if you want to have a second night here,” you’ll show me. Well, I did want a second night. I was 16. I had a gas guzzling car. Most importantly, Mazzio’s had a promotion featuring cool, colorful sunglasses that the rest of my high school surely would mistake for Ray Bans™. I spent the rest of that night washing dishes, busing tables, and mopping floors like a mad man. I had entered numbers and words onto a W-4 for the first time and I was not to be denied. That was 1986, and to this day, the phrase “sense of urgency” makes me think of my first night of a seven year run in food service. It’s also the phrase that has come to mind frequently during the past week as I have watched Joy Hofmeister work to right a wrong. In case you missed it, last Monday night, social media was buzzing with the information that most students taking online state tests were receiving instant scores and performance levels upon submitting their last answer. While I’ve always wondered why getting scores back to the schools takes so long after testing, I wasn’t exactly looking for an instant answer either. After attending a work event, Joy noted on Twitter that she wasn’t ok with this practice either. What I found out several days later was that she called testing staff into the office that night and immediately tasked the testing company, Measured Progress, with fixing it. That’s a sense of urgency. What I also didn’t know at that time was that this new feature of online testing was a surprise left for all of us by the previous administration. In fact, it’s right in the 2013 Request for Proposals (RFP) for the testing contract. Oklahoma’s online testing program stems from the need for students and educators to receive the results of testing quickly as required by law. The online system must provide to students immediate raw score results (and performance levels for pre-equated tests) and complete student results within two weeks for schools and districts. The supplier should provide a detailed description of the system that addresses each of the topics below. In addition, the SDE prefers an online management system that enrolls and tracks paper and online testers within the same program (p. 20). How did we miss that at the time? I guess we were all busy looking up the new testing vendor to realize that the state was asking for new features. Measured Progress actually had to write new code to make this feature possible. I don’t know if it was a large or small undertaking, but they did it, meeting the terms of the contract. When asked by Joy to undo this as soon as possible, they did – in under a week. I won’t get into the horror stories of students seeing the word Unsatisfactory on the screen and bursting into tears. I will say that fixing this problem is a good cap to a solid first 100 days by the new state superintendent. She ended double testing in junior high math. She eliminated the writing field test. She announced the mode of writing for February’s fifth and eighth grade tests. She’s lobbied the legislature for testing relief and money for teacher pay. She actually showed up at the education rally, and other than a slam poet from Mustang, she stole the show. If the first 100 days of her administration have been marked by urgency, I hope the next 1000 will be marked by persistence. There are many more battles to fight. Many are much larger. All involve the same goal – doing right by the students of this state. We are deep inside another blogging challenge. And I have one from last week to make up. In fact, I’m way behind on my blogging. I’ll try to do some catching up the next few days. For now, Blue Cereal Education’s 1200 word challenge will have to wait. In the meantime, if you’ve ever thought of starting a blog, I suggest jumping in on one of these challenges. This is a great way to crowdsource our ideas – and we need more of them. This time, the prompt comes from Iowa’s Scott McLeod. Somehow, I’ve never read his blog, Dangerously ! Irrelevant. That stops now. Sign me up. Seriously, I wish I could go back three years and come up with a catchier blog title. Okeducationtruths? What was I thinking? …that homework tells us what students know and what they’ve learned. In reality, it tells us how compliant they are, and sure, there’s value in that. We don’t know how much help they had or if it turned into a group project. Likewise, an assignment that is not turned in tells us even less. I could cheat and say this exact same thing about grades. …that seat time equals learning. 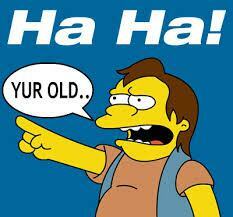 I saw a headline yesterday about parents of a straight A student being pulled into truancy court. What does it say if a student has 20 absences and still has an A in every class? School isn’t a must be present to win scenario, is it? Sure, I think that attendance increases the likelihood that learning will occur. And yes, the students who have a lot of absences and high grades are the exception. Then why punish the exception? …that we can buy curriculum better than we can make it. Find out how much your school district spends on textbooks. Then ask teachers if they could browse the Internet for free content and collaborate on lessons, units, and assessments that would be cheaper and better than what the publishers are selling us. Think about shifting that funding to the pockets of our teachers. Think about the professional growth that would come from such collaboration. Think of the technology that we could put directly into students’ hands. And by the way, I feel the same way about all the computer programs we buy for reading and math interventions. Sure, some are good, but they’re pricy as heck. Teachers are always a better bargain. …that poverty has a binary impact on student learning. Some students are poor and have tremendous home support for education. Some students are wealthy and don’t. Also, there’s a difference between poor and destitute. Some situations are harder to address at school than others. As researchers, defenders of public education, and even reformers, we all fall into the trap of talking about poverty as a singular problem. While schools serving populations with a high concentration of deep, generational poverty are harder places to teach, there are some that have been successful. …that we should create public policy based on the outliers. Some schools defy trends when it comes to poverty and student achievement. A lot of what the teachers do there is replicable in other situations. Some isn’t. We can learn lessons from these schools about hard work and seizing on opportunities – such as smart use of grant money when it becomes available.